Saving for a down payment remains one of the biggest hurdles for would-be homebuyers. But many could look to land a home loan today without stashing away another cent. There are scores of programs that can help buyers purchase a home with little or no money down. The government also backs two zero-down lending options. The problem is that many buyers don’t know about these options or think they can’t qualify. There are scores of down-payment assistance programs in communities across the country. A recent report from RealtyTrac and Down Payment Resource put the number at more than 2,000 nationally. These programs may be offered by cities, counties, nonprofits, employers and local housing finance agencies. Many of them help borrowers defray down-payment expenses and closing costs. Down-payment assistance programs often have limits on how much you can make and how much house you can buy. Still, RealtyTrac found that 87 percent of the 78 million U.S. single-family homes in the study would qualify for a down-payment assistance program in their county. Nationally, the average down-payment assistance comes to about $11,500. On a $200,000 mortgage, for example, most conventional borrowers would need to put down at least five percent ($10,000). 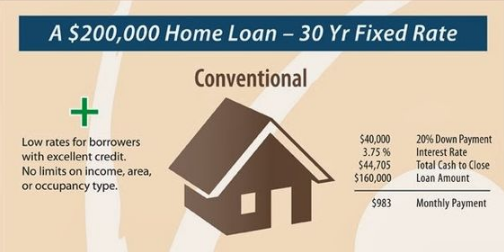 FHA loans require a 3.5 percent down payment, which comes to $7,000 on a $200,000 purchase. Another option is to obtain a loan through the U.S. Department of Agriculture’s Rural Development Program. Along with offering 100 percent financing, USDA loans have credit benchmarks that often allow more room for flexibility than conventional loans. USDA loans have no maximum loan amount, but the program limits participation to borrowers at or below a particular income level. Currently, USDA borrowers can have an income of up to 115 percent of an area’s median income, adjusted for family size. Debt will also factor into how much a home buyer is able to borrow. Only a sliver of the population serves in the U.S. military. But millions of those who have served are eligible for what’s arguably the most powerful loan option on the market — the zero down VA home loan. The VA loan program has expanded homeownership opportunities for veterans, service members and military families since 1944. Qualified borrowers in most parts of the country can purchase a home for up to $417,000 before needing to factor in a down payment. (Obviously, they’d also need to be able to afford a mortgage that size).VA loans also feature more lenient credit underwriting, with lower credit benchmarks than conventional financing — as much as 100 points lower — and more forgiving standards for things like bankruptcies and foreclosures. Last year, about 80 percent of VA buyers purchased without putting down a dime. Despite that, these loans fared well during the foreclosure crisis. To be sure, there are benefits to making a down payment, with equity and a lower monthly payment chief among them. But the kind of nest egg many buyers need can take years to save. The good news is there are plenty of options out there for those who can’t or don’t want to wait.